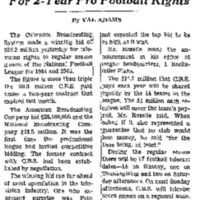 This January 25th, 1964 New York Times article by Val Adams describes the new contract awarded to CBS by the NFL to televise its regular season games for the 1964 and 1965 seasons. The massive bid of $14.1 million a year outpaced the bids of rivals NBC and ABC, and was more than three times the cost of CBS's NFL contract from the previous two seasons. As a result of this deal more football games would be televised each week across the country (local blackout rules still applied) and the number and cost of advertising commercials would also increase. Adams, Val. “C.B.S.-TV to Pay 28.2 Million For 2-Year Pro Football Rights.” New York Times, January 25th, 1964. Pg. 1. Adams, Val. “C.B.S.-TV to Pay 28.2 Million For 2-Year Pro Football Rights.” New York Times, January 25th, 1964. Pg. 1. , “CBS TV to Pay 28.2 Million For 2-Year Pro Football Rights,” The American Century, accessed April 20, 2019, https://americancentury.omeka.wlu.edu/items/show/141.